Native Jewelers Society: For Buyers-Why Buy Native Jewelry? 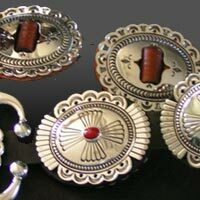 Buying authentic and handmade Native American jewelry can be a rewarding experience. You can always wear your jewelry with pride knowing that you've made a purchase that will help native people to sustain creativity and craftsmanship for years to come. However, it's also important to recognize authenticity and quality when buying native jewelry. The Native Jewelers Society (NJS) community will offer insights, advice and tips to help you become an expert buyer and to foster your relationships with native artists.